There comes a time when all good things must come to an end, whether it is a relationship, job, or even your deck. Yes, even the best deck will only last for so long. In fact, the average lifespan of a wood deck is roughly 10-15 year, depending on maintenance. Some decks last longer and some decks meet their untimely demise before they even turn 10. It really comes down to several factors, including climate, weather, annual maintenance, and normal wear and tear. The only certainty is that your deck will eventually need to be replaced. Based in Northern Baltimore County, Freedom Fence and Home specializes in deck replacement and has completed hundreds of replacements for customers throughout Maryland. Our crews are highly trained, and will treat your property with the care it deserves, protecting your lawn and the surrounding area. We begin by visiting your home and inspecting your current deck. Our representative will then review your choices – hardwood, PVC, and composite – and offer insight and advice to help you make a well-informed decision. Curb Appeal: Let’s face it; an old, dilapidated deck is more of an eyesore than anything. Deck replacement can help restore your home’s curb appeal. Affordable: Deck replacements are affordable and can be completed usually within a day or two. Home Value: Deck replacement is an excellent way to add value and beauty to your home. Safety: Not only is an old deck an eyesore, it is also a safety hazard. Will is collapse? Are there nails sticking up? Ouch! A splinter. Deck replacement ensures that your deck is sturdy, safe, and will last for years to come. 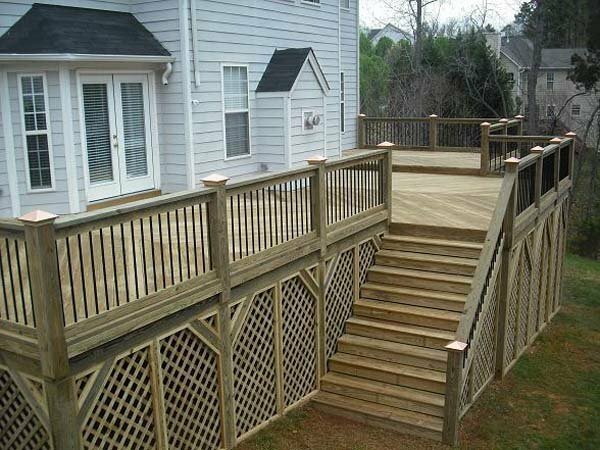 If you have any questions about Deck Replacement in Baltimore, please contact Freedom Fence and Home by calling 443-271-6841 or visit our website. You can also follow us on Facebook and Twitter! This entry was posted on Monday, June 16th, 2014	at 8:04 pm	. Both comments and pings are currently closed.